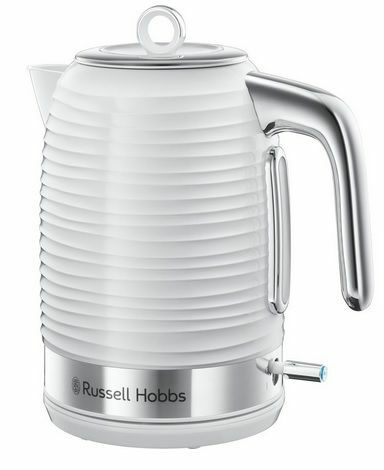 RUSSELL HOBBS 24360 Inspire Jug Kettle White. Make the perfect brew with the Russell Hobbs Inspire Jug Kettle. With its elegant, rippled design, and chrome accents, this kettle combines good looks with simple functionality. The neutral colour adds a touch of style to any kitchen, modern or retro. When you're still sleepy and need that coffee to get started, spilling the hot water is not the most ideal wake-up. That's why the Inspire Kettle features an easy pour spout. Reduce the chance of spillage when you're making a hot drink, keeping you safe and keeping your kitchen worktops water-free. Filling the kettle to the top when you only need one cup can waste energy and cause bills to slowly mount. The kettle lets you measure the perfect amount for one cup and bring it to the boil in as little as 45 seconds. That means you'll save time and energy in the morning, when you're most in need of them. If you live in a hard water area, you may find that your kettle frequently requires cleaning. The Inspire Jug Kettle has a removable, washable anti-scale filter that's designed to remove any ‘nasties' from your water. It makes your kettle easy to clean and keeps it in perfect working order for longer, so you can enjoy the perfect beverage every time.